Patient Appointment Manager - Easy-to-use appointment scheduling software. Because Patient Appointment Manager is so easy to learn and use, the time needed to get started is a matter of minutes, not months. Adding or updating patient information or changing appointments is effortless. Your appointment scheduling software doesn’t have to be complicated or cumbersome. Patient Appointment Manager allows you to quickly search for available appointment times by date, time, or practitioner. Optimize schedules using the waiting list that will tell you if a pending appointment can be scheduled. Sharing appointment information is easy with Patient Appointment Manager. 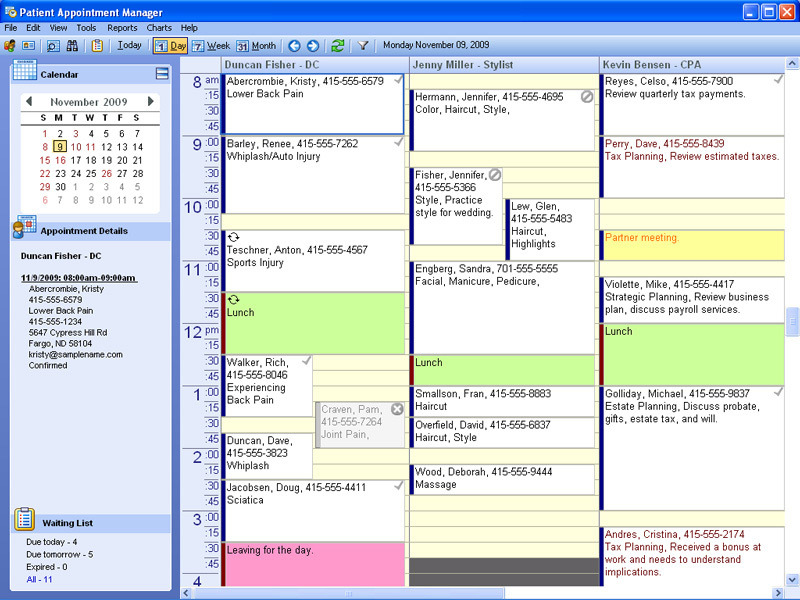 More than one computer can access scheduling information at the same time and changes are seen instantly. Reduce no-shows and cancellations when you remind patients of appointments via e-mail or letter. Use customizable fields to track information important to your business. E-mail providers their appointments for the day for access via any web browser or PDA. Export or print your appointment calendar and reports in various formats, such as PDF, Word, Excel, or HTML. An intuitive design makes Patient Appointment Manager easy to learn and use. Its user-friendly layout puts all of the information you need right at your fingertips. With over 4,000 users relying on our appointment scheduling software worldwide, you can depend on Patient Appointment Manager for your scheduling needs. Our users range from small, single-site operations to multi-national corporations scheduling hundreds of appointments at multiple locations. A single-user license of Patient Appointment Manager is $295. A 2-user licenses starts at $395 and the cost per additional user is only $100. Order risk free! Your order is backed by our 90-day, unconditional, money-back guarantee. Simply put, if you are not 100% satisfied with Patient Appointment Manager, return it to us for a full refund of the purchase price within the first 90 days. In addition, we offer 90 days of FREE phone and e-mail technical support.